Stingy Brim: The smallest brim we can make and still be called a brim! Almost no shade protection here, just style! Some people just look great in short brims! This is a very unique brim for its small size. There is a small charge (as reflected in the price already) since to make This stingy (short) brim because it requires us to actually unweave a larger brim since the hat bodies are turned in from the weavers as a standard size of about 2.75". So we then need to find a hat body that is not yet closed and can be unwoven, then we unweave about half to one inch. We then weave the straw backwards into the brim itself to close the outer edge of the brim, thus requiring two more expert weavers to do more work on your brim before we can even begin to block it (shape it). 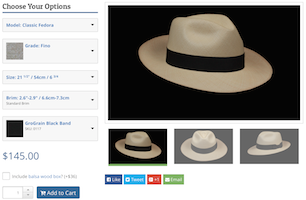 Send us your question about this Cuenca Grade 1 Havana hat, and we will respond to you as soon as possible.